The World Bank recently released it’s latest Doing Business report, ranking Vietnam 69th among 190 economies for ease of doing business – a fall from last year’s position at 68. However, Vietnam’s net increase is still up 13 spots in recent years. The ease of doing business index compares countries against one another to gauge factors that are conducive for businesses operating within the competing regulatory environments. Despite its drop in ranking, Vietnam’s overall score increased 1.59 points from the previous year. Vietnam’s business procedures may be more tedious than its ASEAN neighbors – such as Thailand, Malaysia, and Singapore – however, the underlying reasons that Vietnam has attracted investment in years past have not changed. Compared to higher scoring economies, Vietnam’s low rankings for transparency, accountability, and media reform may not necessarily promote investor confidence. However, these determinants alone do not reflect the country’s economic expansion in recent years. Vietnam’s economic achievements can be attributed to proactive reforms implemented by the government in the context of a politically stable business climate. Although Vietnam dropped one spot in this year’s rankings, the government has shown it is willing to implement practical changes. In 2017, Vietnam stumbled to its lowest overall score in years. Since then, Vietnam has concentrated efforts to improve ease of doing business in the following three areas: starting a business, paying taxes, and enforcing contracts. Starting a business in Vietnam comes with its challenges. It takes an average of 18 working days for a new business to set up, along with a number of mandatory and time-consuming administrative procedures. To improve these areas, Vietnam has released reforms to ease access for businesses entering the market by reducing registration fees. The country has also made online content on enforcing contracts available for companies entering the region. The administrative procedures for paying taxes under Vietnamese law are widely known to be a timely process. As a way to streamline customary tax procedures, a few changes were made over the past year. Companies are no longer required to submit hard copies of the value-added tax return, and joint payments for business license tax and value-added tax are now an option. Further, under the scope of social insurance, employer’s contribution to the labor fund was also reduced. In addition to these reforms, Vietnam performed well in its rankings for getting construction permits (21) and getting electricity (27). 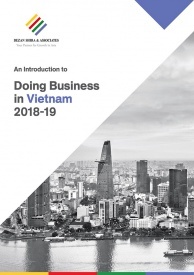 While Vietnam has made steps over the past year to streamline its business environment, the Doing Business report highlighted areas where the country could make further improvements. Vietnam’s scores for getting credit, protecting minority investors, and trading across borders maintained were the same as last year, while its score for resolving insolvency decreased. For international trade, an important area of concern that is worth emphasizing is the process for imports and exports in Vietnam. As of now, the timeframe for trade is drawn out, as procedures can take up to 21 days to complete and require numerous documents. The inefficient process means that trade across borders can be a major hindrance for businesses in Vietnam, despite the importance of exports for its economy. 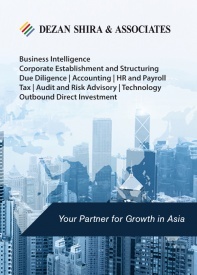 Notably, the ease of doing business measurements are limited to Ho Chi Minh City – the country’s biggest and most developed city – and do not cover the diverse regions within Vietnam. 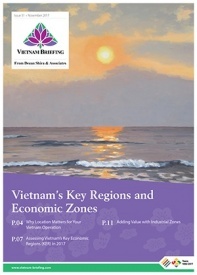 Foreign investors should therefore note that the north, central, and southern parts of Vietnam offer their own unique advantages and challenges and that there may be regional variation in the country’s business environment. Further, due to the inflow of FDI in Vietnam, governmental procedures have not kept up to pace. Government offices may be over-capacity and do not necessarily have the time to address all challenges they are faced with. For a foreign investor who is newly entering the region, using a third party to facilitate administrative tasks can help shorten set up time, as they often have knowledge of working in a specific industrial zone and the country’s legal and taxation landscape. The World Bank’s report suggests that Vietnam still lags behind many other Asian economies in terms of its business environment. However, ease of doing business alone does not necessarily reflect the drivers of FDI into the country. Vietnam has cultivated a receptive investment environment through various progressive measures introduced in recent years, combined with other favorable macroeconomic factors. Nevertheless, while Vietnam has become a popular destination for foreign investment, businesses would do well to recognize the areas in which doing business in the country can be challenging. « US-Vietnam Bilateral Trade Talks – What’s on the Agenda?